If you are surrounded with modern inventions and living in a city like me, you will have various opinions about tribes and villages which probably based from what you've watched on the tv or books that you've read. We seldom question ourselves what will be a tribal man think about us when he sees the food we eat, the way we live and also various of unknown modern devices to him which we have been using it countless times in our lives? Will he feel overwhelmed with all these modernization occurring in such an estranged world for him? Bhajju Shyam, a well-known artist from the Gond tribe in central India, shares his experience of his first encounter with the western culture by using his art to expresses his perspective from his own world. Bhajju is invited to London to paint murals on the walls of an Indian restaurant. Traveling to the outside world is not something he ever dreamed of before. Bhajju's tribe is one of the poorest tribes in Indian society. Many people still regard the tribal communities as primitives without culture. People like him seldom get to travel and travel abroad is something out of question. This beautiful book shows his Gond style of art which uses a lot of patterns and animals. He expresses his thoughts about London and the differences between the western and his own culture. We also get to understand more about Gond traditional beliefs through the arts especially each piece of art has its own description with it. What I loved the most is he uses the Gond style to bring the two different worlds together with symbols. Big Ben is the temple of time for London but a rooster is the symbol of time for Gond and he combines both in his art to tell the story. 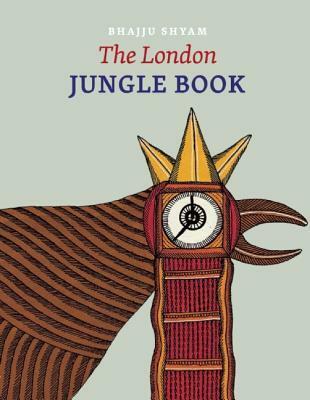 More reviews can be found on Goodreads: The London Jungle Book.